Clean. Crisp. Masculine. A unique citrus blend inspired by the cool feeling of fresh air with warm aromatic notes. 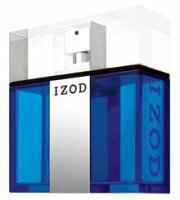 A new wave in men's fragrance that brings to life the adventure, adrenaline and energy of the IZOD lifestyle. The citrus-marine fragrance was developed by perfumers Raymond Matts and Annie Buzantian; the notes include lime, tangerine, grapefruit, mint, cucumber, air accord, cotton, cyclamen, lavender, juniper, tobacco, saffron and incense. Instant Vacation Caribbean (shown) is "inspired by a fresh tropical breeze", and includes notes of mango, starfruit, nectarine blossoms, orange flower, red heliconia and teakwood. ($8 for 50 ml Fragrance Mist). Izod smells like clemetines. There is nothing 'blue' about the scent at all. It doesn't smell aquatic to you? Well good then — usually the air & water take over. I know! The blue bottle is attractive, but misleading. I think I would wear this for myself. Citrus-Marine = “A new wave in men's fragrance” ??? Who're they kidding? However, a “non-blue” clementine+lavender+juniper scent doesn't sound bad to me, so it may actually be worth a try. Also, I like to imagine a male/female couple who wear Instant Vacation Caribbean (him) and Very Irresistible Summer Cocktail (her). I agree with bartamy's comments on Izod. Not your typical fresg aquatic-ozonic–you catch a lot of the lavender and I also catch the greener notes of the tobacco. The ozone-aquatic notes seem to just fill in the spaces and do not take over. The saffron and incense notes seem to be working in reverse. You catch a spiciness and woodiness in the beginning, but it doesn't dry down to these notes. It'll be one of my Spring/Summer staples–just bought a bottle. I've been wearing too many heavy orientals I need a breath of fresh, uhm, 'air' and I'm not wanting too much of the tart citrus this time around. Thanks — still haven't smelled it but I will! Sounds nice. Antiseptic muchly? Smells like a hospital. It isn't a mover for me, no one comes looking for it especially and those who try the tester don't seem to care for it much. I've probably sold 3 bottles of Izod for men in all the time I've had it at my counter. I still haven't tried it myself — need to do that!